Why Study at CMU Qatar? 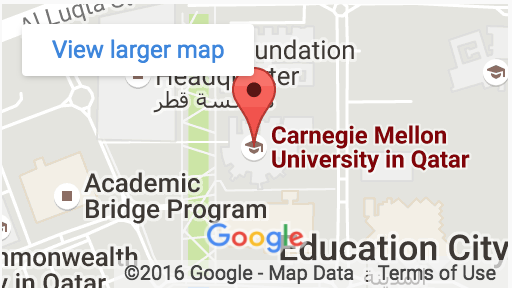 DOHA, QATAR: Knowledge transfer in the areas of technology and smart infrastructure will be key to Qatar’s long-term development, said Siemens CEO Adrian Wood to an audience of students and faculty members at Carnegie Mellon University in Qatar (CMU-Q). Wood was speaking at CMU-Q’s Dean’s Lecture Series, a forum for leaders in government and business to share insights on relevant and topical issues. To date Siemens has provided more than 15,000 hours of internships to students from local universities. Through the company’s secondment program with Qatar Foundation (QF), students have the opportunity to gain experience at one of 200 Siemens offices around the world. CMU-Q offers undergraduate degree programs in biological sciences, business administration, computational biology, computer science and information systems. Siemens provides learning opportunities to CMU-Q students in all majors by offering internships, sponsoring student innovation challenges like the annual Hackathon, and providing mentorship and guidance through career information sessions and consultations with student groups. Several CMU-Q graduates have pursued careers at Siemens. When is the application deadline?